Killer Characters: One last fling with Audrey Bloom—with a giveaway! One last fling with Audrey Bloom—with a giveaway! As a florist, I have to admit, I’m not always that keen on the tradition of flinging a bouquet--especially one I might have spent hours designing--into the air with such gleeful abandon. I guess it was a compromise that went back to the middle ages, when wedding guests actually tried to rip off bits of the bride’s clothing for luck. Yeah, given the choice, I’d be more willing to part with my flowers than my dress. But I always wince a little, especially when a full bouquet goes flying into the air. For one thing, I worry about liability. Some are heavy and can have sharp elements. I always recommend a smaller bouquet, just for tossing. I chose to break apart my hand-tied bouquet and gave out all the flowers to the young girls present. Even a little violet for baby Vi. It was so sweet and I have great pictures. But the flowers for my own wedding? Well, I did have a bouquet in mind, back in the day. But it hardly seemed right to use it, especially since there was a change in groom from when I thought Brad and I had a future together. But many of the elements stayed the same. White roses for innocence. These took on new meaning. The last few years I’ve learned a thing or two about innocence and about guilt, and about the sometimes thin divide that separates them. I’ve come to realize villains generally aren’t hunchbacks with handlebar mustaches, with pronounced evil laughs as they tie victims to railroad tracks. They’re real people, who, for whatever reason, make very bad decisions. Innocence is something that has to be carefully maintained, so that the evil of this world doesn’t color us and make us jaded, cynical, or bitter. Yes, I kept the white roses. colored zinnias, which speak of remembering absent friends. As Kermit the Frog (channeling Dickens) said, “Life is made up of meeting and partings. That is the way of it.” I was happy to see so many friends, if only for a little while, make it to the ceremony. Even my mother and father seemed to get along for a few hours. I also kept the Queen Anne’s lace, since it reminded me so much of my beloved Grandma Mae. And the ivy, which symbolizes friendship and fidelity. I did want something to symbolize the groom, who stepped into my life and quickly became my cohort, my sidekick, my friend, and the love of my life. I agonized over the choice for weeks, and then surprised myself by picking stephanotis, that almost clichéd symbol of marital bliss. But you know what? I couldn’t have been happier with my choice, either of flowers or of groom. Author’s note: The Bridal Bouquet Shop series from Berkley has ended, and while Audrey and her friends might pop up from time to time here on Killer Characters, starting next month, I’d like to begin to introduce you to some new friends from my upcoming series, The Vintage Toyshop Mysteries, which debuts in October from Crooked Lane. Meetings and partings. Or in this case, partings and meetings. Yes, that is the way of it. 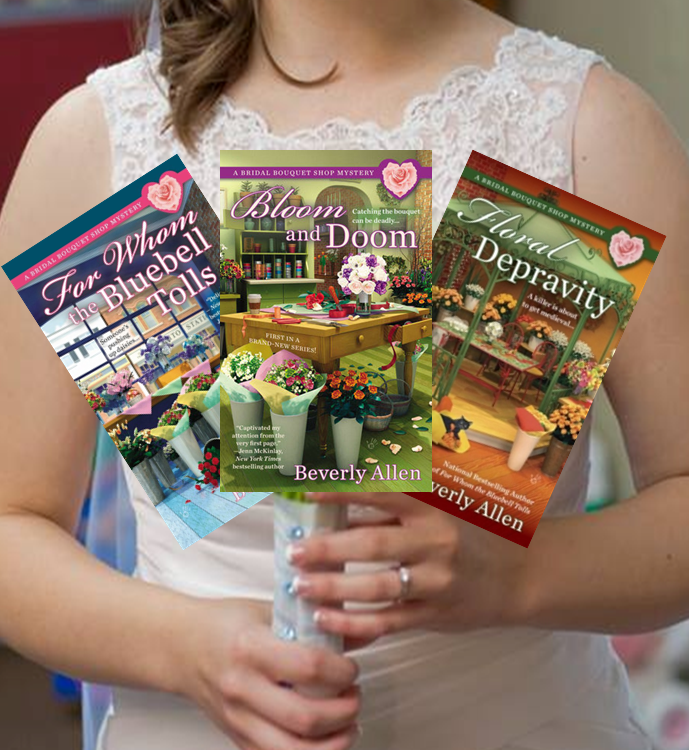 Audrey Bloom’s Last Fling Giveaway: For a chance to win one of these three books (BLOOM AND DOOM, FOR WHOM THE BLUEBELL TOLLS, and FLORAL DEPRAVITY), tell me your favorite flower and which book you’d like to receive if you win, if you have a preference. Entries will be accepted, on this post only, until midnight of July 5th, after which winners will be chosen randomly from the comments and notified. My favorite flower is a tiger lily and I would like to start a new series with bloom and doom. I love orchids. In don't know types of orchids but I think they are very pretty. Love a chance to read Bloom and Doom. Thank you for the giveaway. I love peonies and am lucky enough to have some in my yard. I would love to win For Whom the Bluebell Tolls. Thanks so much and will enjoy meeting your other new characters in posts to come. I love carnations and would love to win Bloom and Doom. Thanks for the chance. My favorite flower is the moonflower, a beautiful white flower that blooms only at night! I would be so happy to win any one of these books! I love daffodils! Any book would be appreciated. My favorite flower is the bluebell. I would love to win For Whom the Bluebell Tolls. Thank you for this chance. I love daylillies outside and Christmas cacti?? inside. I'd love For Whom the Bluebell Tolls! I love marigolds. They are pretty and they remind me of my Grandmom. She was special to me. I would like to win For Whom The Vluevell Tolls. Thank you for the opportunity. I have a black thumb! That said I grow herbs for cooking and salads. I have a yearly membership to the Brooklyn Botanical Gardens and spend quite a few Sunday afternoons in the Rose Garden there, taking photos which sometimes end up on my FB page. I love the perfume and the amazing array of colors. I love tulips and would be happy with any book that I could win. Thanks for the giveaway. Sunflowers have been my favorite almost since birth. They make me happy . I would absolutely love to have any of the 3 books. I would pick For whom the bluebell tolls . I love all types of lilies!!! So many series not continuing. I love lilacs. They bordered our driveway when I was growning up and I can still remember that smell every time we drove in our out. I would love to win any of the books. Thanks. I like meadows of wildflowers. I'd like the first book if I win. I grew up with a grandmother who grew roses. Turns out her last name is also Rose. So I now take pride in growing and planting my own roses. So for that Roses are my favorite flower. If I had to choose my preference is to start at the beginning with Bloom and Doom. Thanks. My favorite flower is the red oriental poppy. I'd love a copy of Floral Depravity. I absolutely love Parrot Tulips. So beautiful. Thank you!!! My favorite flower is the Pansies, love their face's. I don't have a preference in which book i would receive. Thank you! Lilacs are my favorite! I'm missing Floral Depravity from my collection. Thank you for the giveaway opportunity. My favorite flower is the pink rose. I would love to start your series with Bloom and Doom. my favorite flower is bleeding hearts they are so pretty. I would love to read any of these books. LOVE, LOVE hydrangeas!!! I would love to have the first book!! I have been looking at starting this series!! Carnations are my all time favorites. They have been my favorite since I was small. If I'm chosen a winner I would appreciate any of the books offered. Thanks for the giveaway. Carnations and daisies are my favorite flowers. :) I'd like to win Bloom and Doom since this is an all new series to me! Thanks so much for the chance to win. Daisies are my favorite. I'd love to have book 2 in the series! Thanks! Carnations. The first in the series please. I like to start at the beginning. I love peonies. I have them along the side of my house, I just wish the blooms would last longer. Sorry to hear this series is ending, I really enjoy it. I would like to read "Floral Depravity". I have the other two in the series. Thanks for the chance. My favorite flower is Poppy. It is my son's very private house only nickname. I love all wild flowers but my favorite is daisies. My middle name is Rose so that's all my family could associate me with growing up. I now hate roses. I would love bloom and doom. The Iris is my favorite flower. I have no preference in the books. I love peonies. But I have to say Lily of the Valley brings me back to a childhood memory. I do like daisies. Such a sweet flower. No preference re the books. I could not choose. That would be red roses. However I like a variety of flowers, as long as I don't have to get too close to them. Too many allergies. Although I haven't read any of the choices, Bloom or doom would be great. Thanks for this opportunity. My favorite flowers are wildflowers, especially bluebonnets. I have all of the Bridal Bouquet books, and I really enjoyed them. I am so sad to learn that the Bridal Bouquet series is ending. I don't know if that is by choice or if it is due to publisher issues. I have read that publishers are cutting back on Cozy Mysteries which is really disappointing. I will look for your new series. Blooms and Doom would be the book I choose to win. My favorite flower I would have to say is carnations. Thank you for the chance to win and have having the giveaway! My favorite flowers are tulips. So sad to see this series end, but thank you for writing it and allowing us to enjoy what we've had. I look forward to reading the new series. If I were to win my choice would be Bloom and Doom (somehow it's the only one that I don't actually have a copy of yet). Thank you for the chance to win. My favorite flower is the lilac, such a beautiful smell! But really I love all flowers. I would just love to receive any of your books. Thank you. j.marshall730@yahoo.com. I love Gardinias and Daffodils. thanks for the chance any book would be lovely! Carnations - they are lovely and their scent is so lovely. Any color will do. Hello! My favorite flower is the Yellow Rose! This series of books sounds wonderful! I have no preference of which I would like to receive, I would enjoy reading any one of them. Thank You! Barbara, I have all three books already, so I don't need to win one. Just wanted to let you know that I am so sad to see this series end. I would follow Audrey to another publisher or self-pub, in a heartbeat. Our garden is set up to bloom all year long, and I love whatever is in bloom at the time. If I had to pick a favorite, it would be the lily of the valley bed under a tree in our back yard. It developed from starts from my mother's garden. Lilacs I love the smell and color!! Lavenders!!! Any book you picked out would be awesome!!! So hard to choose but I have to pick Lilacs...their smell is lovely and the colors are So pretty....I would accept any of the books because I have not started this series yet. I have always liked daisies. Any book would be fine with me.Thanks for offering a choice for us. I have a shooting star hydrangea which I love! Would love to have whichever book is the first in the series, as I haven't read any, but I will check them out. I love pansies! I would love Bloom and Doom. Thanks for the chance! I love pansies and lily of the valley. I love to smell lilacs. I would love Bloom and Doom. Thanks for the chance! THIS CONTEST IS OVER. WINNERS ARE: SKKORMAN (BLOOM AND DOOM), HOLDENJ (FOR WHOM THE BLUEBELL TOLLS), AND HANNAH03 (FLORAL DEPRAVITY).